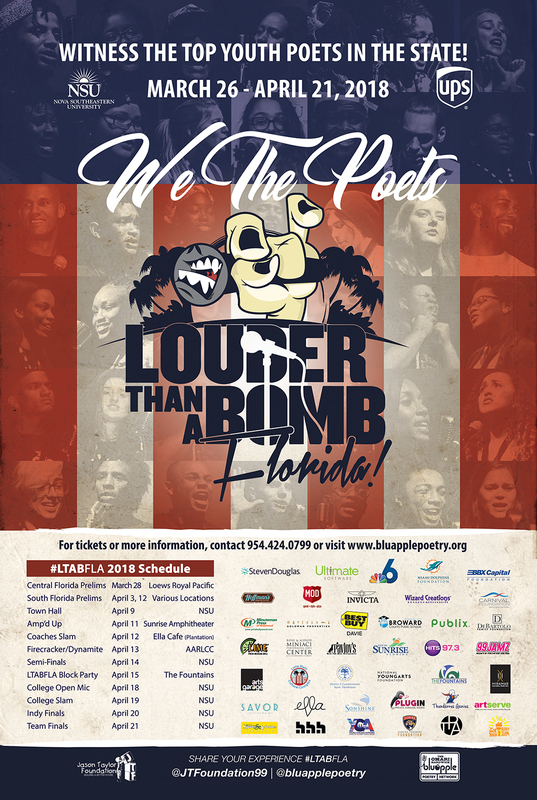 For the fourth consecutive year, the Jason Taylor Foundation is giving the South Florida community the chance to witness the top youth poets in the state compete during a cutting edge event – the Louder Than A Bomb Florida Poetry Festival presented by Nova Southeastern University and UPS. This highly anticipated event takes place from March 26 – April 21, 2018. 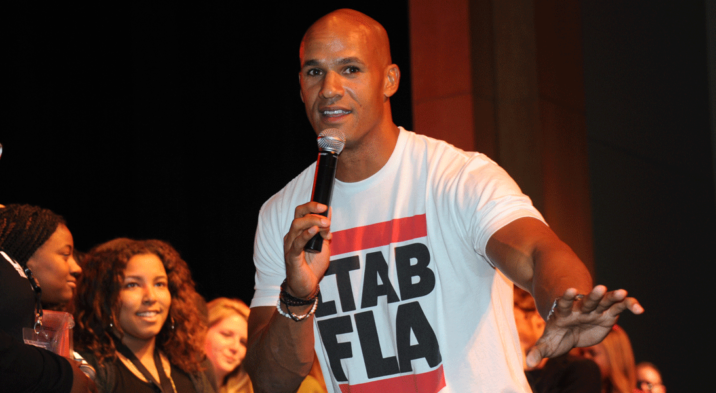 Dubbed the “Super Bowl of poetry,” Louder Than A Bomb Florida (LTABFLA), a Jason Taylor Foundation arts and education project, features a friendly spoken-word competition between school-based poetry teams representing high schools from across the state. Funding from Nova Southeastern University, UPS and a host of other community partners has assisted the Jason Taylor Foundation support the schools’ efforts by providing year-round, in-class and after-school instruction, which will culminate in this 27-day festival. For the first time in LTABFLA history, a Central Florida preliminary round has been added to the competition and will feature schools representing Brevard, Columbia, Duval, Hillsborough, Orange and St. Lucie counties, while the South Florida regional bracket will be comprised of more than 30 schools from Broward, Miami-Dade and Palm Beach counties. Since founding the bluapple Poetry Network with actor and poet Omari Hardwick in 2012, the Foundation has helped more than 65 schools activate this program, with more than 1,200 participants inspiring their communities with poetry.Louder Than A Bomb Florida is a festival featuring poetry bouts, workshops, exhibits, and ultimately the crowning of Florida’s top youth poetry team. The most critical component, however, is the year-round, meaningful instruction inside the classroom and after-school clubs, with teachers and teaching artists who create and facilitate a safe space for individual and collective expression.In addition to Nova Southeastern University and UPS, other supporters of Louder Than A Bomb Florida include 99 JAMZ, Arts Garage, ArtServe, BBX Capital Foundation, Best Buy of Davie, Broward Schools, Carnival Foundation, City of Miramar, City of Sunrise, Commissioner Keon Hardemon, DeBartolo Family Foundation, Ella Café, Florida Panthers Foundation, Goldman Properties, Heroes of Hip Hop, Hits 97.3, Hoffman’s Chocolates, Invicta Watch Group, Jax Youth Poetry Slam, LIME Fresh Mexican Grill, Little Haiti Cultural Complex, Miami Dolphins Foundation, Minuteman Press of Hollywood, Miramar Cultural Center, MOD Pizza, NBC-6, Pavlov’s Ring The Bell Management, PlugIN Private Karaoke Rooms, Publix, Savor Cinema, Sonshine Communications, Sports & Activities Directory, StevenDouglas, The Fountains, The Performers Academy, Thunderous Genius Creative House, Ultimate Software, Urban Word, Wizard Creations, YoungArts Foundation, and Young Chicago Authors. For more information, or to purchase tickets for Louder Than A Bomb Florida events, visit www.bluapplepoetry.org or call (954) 424-0799.